I don’t need to tell you how much I look forward to the three books and theme every year from Peirene Press ,so here we are in the year of coming to Age it is the first of three book this year ,written by Uzbek Journalist ,poet and Writer .He escaped in 1994 from Uzbekistan to the Uk .He has since worked for the World service and he has published a number of book which have been translated into various European languages .His books are banned in his Homeland . Anyway , I was standing at one end of the carriage , gazing out – for the fourth day already – at the deary, monotonous steppe ,when a ten or twelve-year-old boy appeared at the other end .He held a violin and suddenly started playing with such incredible dexiterity and panache that at once all the compartments doors slid open and passengers dowsy faces appeared . Is it a young boy thou ? 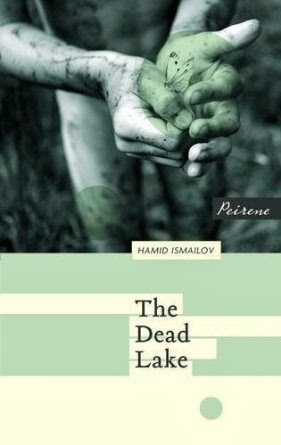 The Dead lake (a title for UK edition the Russian version is called prodigy Erjan ,But I prefer our title because it captures what the book is about Yerzhan the main character of the book enters the Dead lake and his life is forever frozen by the one short act .For this is the soviet hinterland and the pollution caused by the Nuclear industry in the Kazak countryside .Yerzhan is a musician that plays the Folk violin ,he is in love with his neighbour’s daughter .So we see what happens when a boy on the Cusp of manhood has it whipped away from him after swimming in the dead lake and stays the Boy we meet him before during and after this when as a man in his mid twenties he hasn’t aged a day and is now a man in a boy’s body . The water was dark Blue , its own blueness added to the blueness of the sky ,Yerzhan saw his own reflection as a vague blob .His eyes had grown tired from uninterrupted galloping ,with nothing but yellow steppe flowing into them . The first sight of The dead Lake . Now of course ,I read the review in the guardian and Gunter Grass Oscar comes to mind ,but I was also reminded of F scott’s Benjamin Button for the story is partly a story of Love lost a point when love might have been but due to one growing old and the other staying for ever you this love can never be .Also music is a big part of this I’ve not listen to Uzbek Music but have heard a number of Ukrainian and Russian Folk music over the years so have an Idea and Of course this is maybe the one Job left for Yerzhan as a musician where size doesn;t matter ,Then there is the other side the Post Soviet Fallout of Pollution , Atomic test sites etc ,etc .We here so little of this but according to figures mention it effected 200000 people in the soviet era in just Uzbekistan ,shocking figures really .So is it going to be another bumper year from Peirene press ,well yes Meike has turn up trumps again .